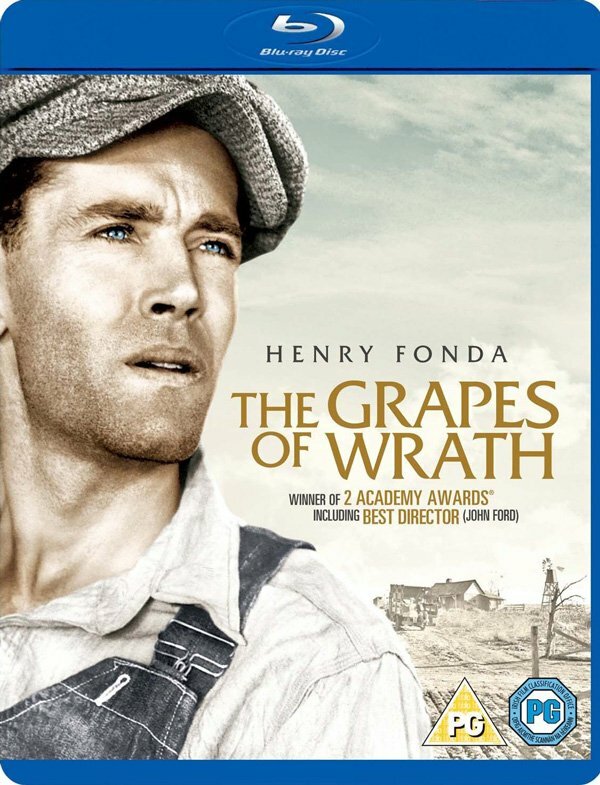 It’s time to take a look at the John Ford film The Grapes of Wrath (1940) starring Henry Fonda. So without further ado here’s my The Grapes of Wrath Blu-ray Review. When Tom Joad (Henry Fonda) returns home to his parents’ farm in Oklahoma after four years away he finds it deserted. He however meets a former preacher named Casey (John Carradine) who tags along with him. Not sure what to do they decide to stay the night when they hear someone moving around in the house. As it turns out its one of their neighbours Muley Graves who then explains that all of the farmers are being forced off the land. Tom joins up with his parents and decides to go with them to find work in California a place where the promise of plenty of work seems like the chance to start over. The film is directed by John Ford with the cinematography handled by Gregg Toland. The Grapes of Wrath is essentially a road movie as the Joad family move from town to town on their way to make a new life in California. This mechanic helps to keep the story moving and interesting for over two hours. There’s no mistaking it’s a really well made piece of both filmmaking and storytelling. Director John Ford won the Academy Award for Best Director for this film in 1941. The music is provided by Alfred Newman and is very much in keeping with the tone of the film. The acting is very good with Henry Fonda as Tom Joad really excelling. He plays a guy that wants to and tries to do the right thing against an impossible set of circumstances. In fact Fonda was nominated for the Best Actor at the Academy Awards for his portrayal of Tom Joad. Jane Darwell did win an Academy Award for Best Supporting Actress as Ma Joad. John Carradine plays Jim Casy a former preacher that’s lost his way, he adds plenty of energy to proceedings. I have to admit I don’t recall having ever seen The Grapes of Wrath (1940) before and I found it to be a thoroughly enjoyable film. Henry Fonda is an actor that is very easy to watch and one that keeps you invested in the family’s plight throughout. This one’s well worth a look especially as it now available on Blu-ray. The picture quality is very good, with a clean and sharp picture throughout, nothing to complain about here. On the extras front there’s a decent amount that gives some interesting background into the making of the film such as how the ending differs from the novel. The Grapes of Wrath (1940) is available now on Blu-ray. A thoroughly enjoyable film now fully restored and available on Blu-ray.